om done with it. Right now, I’m attempting to prioritize my projects, so I’m wondering what level of interest this project has. If nobody’s interested, I’ll just shelf it until the major projects are done, but if anyone is actually interested, I’ll put it to the front of the heap. It’s a space-western that follows Noah Wimmer, a kid who discovers that the rock formation on the outskirts of town is actually something much more. It’s something that could change the fate of the universe and it’s only protector is a tired old man. At the end of this sample (the first episode), I’ll have a poll. If you want to read more, let me know. I’ve also been toying with the idea of turning it into an audio show, where I narrate the whole thing into a free podcast. Dust kicked up behind Noah Wimmer’s truck. The wide tires carried Noah over the vast purple desert that was the world of Paradiso. The truck itself was a marvel of engineering. Originally an X10-80 Hauler, built long before Noah’s mother was a gleam in her daddy’s eye, it had since been modified, repaired, torn apart, rebuilt, and worn back down at least a hundred times. Most of those were by Noah own engineering skills. Even though the truck was a tool for work, it was Noah’s freedom. The old X10 had a large flatbed for hauling supplies, and that’s how Noah was using it. Noah wanted to just forget his cargo and drive on, forever chasing that feeling of escape that the X10 gave him. He could, too. He could drive forever on this large planet. Mostly because of the solar-panels on top of the truck. The planet of Paradiso was in a binary star system and the stars were spaced out enough to only afford Paradiso with a little over an hour of dark per 24 hour day. Solar power wasn’t only abundant, it was in surplus. The wind tore through Noah’s chin-length blond hair as he crested another dune. At 17, Noah wasn’t happy with any of his prospects. He was taller and thinner than the average and that same height kept him from working in the mines like most of his peers. He had planned on joining the WaterCorp, but they had an age limit that he was four years too young for. That left the Freight Teams. Paradiso’s one moon was called Crypta. Crypta was a lush forest, filled with everything that Paradiso lacked. That included carnivorous plants and animals that were so fierce it made the planet uninhabitable. Fortunately, it didn’t make it impossible to visit. The resources, such as food, building materials, water, and exotic souvenirs made for a lucrative trade on Paradiso. The Freight Team, taking advantage of the weakened gravity caused by Crypta’s close proximity, launched ships onto the moon and collected the resources before returning to Paradiso the next day. Whether you were a pilot, a loader, or security, the job was incredibly dangerous. Most of the plants caused negative allergic reactions in humans, and the beasts of the planet were excellent hunters. Noah shook the thought from his head and returned his focus to driving. He hadn’t mentioned to his mother that he was interested in joining the Freight Teams. He had no doubt what her reaction would be. She’d kill him long before the moon did. It had been at least thirty kilometers between the supply drop from Crypta and Noah’s mother’s store. Cresting the next dune, the store came into Noah’s view. The store was officially nameless, but known to the locals of Paradiso as Wimmer’s Place. Noah’s family had owned and operated it in some capacity or another for the last four generations. Noah could feel the pressure for him to continue the business, but he couldn’t break his mind from wanting a new experience. Or new experiences with The Freight Team. Even with the pressure that he was feeling, Noah knew that his family didn’t actually expect him to take over. They knew him for what he was and all hoped, and bet on, his sister, Tessa to take over. To be fair to his family, even Noah knew that they encouraged his ambitions. They wished for him to reach for the stars, only not so literally. Noah pulled up to the store. It was a large brick and metal structure, built to withstand sandstorms and whatever else anyone could throw at it. The windows were vertical slits, mostly to allow weapons to slide out in the case of a siege, but also for allowing light in, while protecting from the storms. It had been months since anyone had tried to lay siege to the store, although robberies themselves were more recent. Noah and his family, as well as some of the more loyal locals, had become quite the impressive little army in this lawless land. The last siege had ended with the loss of only one barrel of water and a few lives lost on the side of the attackers. The store was a resource, and destroying it wasn’t what the attackers ever wanted. They wanted the supplies without paying for them, but they also wanted there to be more supplies in the future. So, even with the loss of some life, they still planned to attack the store without grinding it in the dust. It had been that way for the entire four generations. It even became habit about sixty years ago to leave one of the barrels poisoned. Only the Wimmers ever knew which one it was. Parking his X10, Noah hopped from the cab and grabbed a crate from the bed of the truck before walking in. He walked by more vehicles on his way in. Noah recognized all of them. Kreager Evans’ skimmer was parked directly next to where Noah had parked the X10. Kreager was about Noah’s age and mute. He was hellbent on building a a better dehumidifier for pulling water from the air. On a desert world, water was the most valuable commodity, even with Crypta within reach, and such a device was a worthy cause. Unfortunately, Kreager was entirely self-taught, and hadn’t made any breakthroughs in water collection yet. Parked tightly next to Kreager’s skimmer was Chartrand family wagon. A group of farmers with a greenhouse about a hundred kilometers to the south of the store. They were one of the bigger traders with the Wimmer store, trading rare vegetables for large quantities of water. Karen White’s old rover was parked so close to the front entrance to the store that Noah had to squeeze by it just to get in. Karen was a sour older lady who was quite fond of her chew sticks. Karen was the first person that Noah came across when he made had finally squeezed into the store. He set his crate down on the counter just as his mother came out of the back carrying a stack of boxes tied with twine. Karen eyed him and began to waggle her finger while gnawing on a chew stick. Noah rolled his eyes at her, but stepped up and grabbed the boxes from his mother. Annie Wimmer was in her late forties and lean from many years working the store on the dried out desert world. She wore glasses, but Noah was pretty sure that she didn’t need them for anything other than reading. She was sharp and quick witted and a dangerous woman with her rifle. The Bridge in question was a relic from some long past war. Back before the migration, Paradiso has been part of some galactic conflict and the Bridge had been used as some sort of landing pad for ferrying soldiers to and from the dust covered planet. Humanity hadn’t faired well during that war, and by all accounts Paradiso was all that remained of the human race. Once the battle had been lost, whatever connection had allowed people to ferry over the Bridge was cut, Paradiso was cut off from the Universe, and the Bridge became a large stone memory. It was called the Bridge because of it’s general look. It was a set of stone stairs that lifted off of the desert and then arced over and flattened out, much like an actual bridge. Unlike an actual bridge, the Bridge stopped abruptly right in the middle of the would be bridge. That mid-air terminus led many to believe that it was a loading platform for spacecraft. People would load up onto the bridge and then step from it into the open doorway of a spacecraft, prepared for battle. It makes sense, Noah thought. Wimmer’s Place was the better of all the stores on Paradiso, having been around long enough to build a good relationship with The Freight Teams. It as possible that The Freight Teams gave better product to the Wimmers. “That sure doesn’t seem fair to you,” Karen mumbled. “Oh?” asked Noah, genuinely curious. Karen’s face blanched at that and Noah had to turn his head to hide his smirk. Karen then turned away from Annie and started pushing Noah and her boxes toward the door. Loading Karen’s small rover was a more a matter of holding her boxes of cabling while she maneuvered her mess around to make room. About five minutes after reaching her vehicle, Karen finally stepped aside and let Noah set the boxes into her rover cab. The moment that he had stepped back from setting down the boxes, Noah heard the whine of another vehicle. In unison, he and Karen turned to see Eckhart and his solar buggy pull up beside them. Eckhart wasn’t as old as ancient Karen, but he was definitely in his higher years. His olive skin glistened with sweat as he stepped out onto the purple sand. His hair, once black, was white and cut very close to his scalp. His head and his beard must have been shaved at about the same time, as his white beard was the same length as his hair on top of his head. He was dressed in a loose brown robe made from a light material. Covering the top of his close cropped hair, Eckhart wore a wide-brimmed hat to keep the sun from his eyes. Eckhart returned Noah’s nod, dipped his hat to Karen, and then headed toward the store. He stopped as he came shoulder to shoulder with Noah, tilting his head as if attempting to hear something. “Get Karen out of here. Now. I saw riders coming this way.” Eckhart hesitated. “They didn’t look…respectable.” He slid past Karen’s rover and into the store. “Karen, I think you’re all loaded up. How about we get you on your way?” Noah sealed the back of the rover and watched as Karen climbed in and pulled away, mumbling something about pushy youth. Once Noah was sure that Karen was good and gone, he turned and watched as three riders on glider bikes crested the same dune that he had also crested earlier in the X10. Inside, Eckhart was throwing some more goods from the shelves and into the box that was still where Noah had left it. As he did, Annie was rattling off prices, but there was no sign in Eckhart’s eyes that he cared at all what the price was. The sound of the riders’ glider bikes interrupted Annie’s pricing and halted Eckhart where he stood. He nodded toward the Chartrand family looking concerned by the sudden change in the atmosphere. Annie hesitated and then nodded. She didn’t need panicked customers, and Eckhart seemed sure enough of himself. “They could be customers,” Annie tried. Eckhart shook his head and said quietly, “We both know that they’re not.” With that he turned and headed back toward the door. Outside, the three riders climbed from their glider bikes and straightened their jackets. On their sides, plasma pistols hung on loose holsters. Each of them was at least a decade older than Noah and they were smiling to themselves as they took in the wiry boy. “Can I help you gentleman?” Noah asked. Instead of answering, the rider in the lead pointed at Noah, eliciting a laugh from his companions. They moved to walk past Noah and into the store, but Noah’s hand shot out and grabbed the nearest one by the arm. The rider that Noah grabbed looked down at Noah’s hand and then at Noah before yanking his arm back. The rider reached for his plasma pistol and his companions followed suit. “Are you the boys who mess with Roger Lincoln’s barn?” Eckhart said from the door to the store with his arms crossed. Distracted, the riders left their hands resting on their pistols but didn’t draw them. The rider that Noah had grabbed said, “It’s a desert world. Fires happen.” His companions didn’t even attempt to hide their snickering. Eckhart nodded slowly and slid aside his robe, revealing his own plasma pistol. He walked forward, stepping closer to the group. The mirth left the riders as they saw the gun and they tightened their grips on their own holstered weapons. “Roger,” Eckhart continued, “is a good man and a friend of mine.” He unclipped something from just behind the pistol and brought his hand forward slowly, letting the robe fall back over the pistol. All that Noah could see was a small flat disk that fit into the palm of Eckhart’s hand. With a flick of his wrist, the disk flew past the riders and Noah coming to a rest underneath the glider bikes. Eckhart reached out and touched Noah’s shoulder. “Get inside and check on your mother.” There was no room for arguing in Eckhart’s tone, and Noah didn’t hesitate to move back toward the store. He didn’t get as far as his mother, though, instead choosing to stand inside the door to watch Eckhart and the riders. “Get out of our way, old man. We’ll kill you if you don’t,” said the same rider as before. He took a breath and looked between them before realizing that they still didn’t understand what he was talking about. The lead rider wavered just a bit and glanced back toward his bike. Following their elected leader, the other riders looked back at the bikes. When nothing happened they turned back to Eckhart with ear to ear grins. Then a loud whumph! sounded. It was followed by an equally loud crunch of metal. Spinning back around, the riders and Noah could see that two of the bikes were destroyed. They had been flattened into the sand. The third back had missed the pull of the Newton 4 and survived. Before they could fully process what they were seeing, Eckhart stepped forward and pulled the plasma pistol from the holster of the nearest rider. Just as quickly as he pulled the pistol, he put a bolt of plasma into the knee of the rider in the middle. Turning slightly, Eckhart aimed the plasma pistol at the final rider before he could draw his own weapon. “The way I see it, you’re lucky in that y’all still have one bike.” Eckhart waved his free hand at the middle rider who was missing half of his knee. “Now you can take your moaning pal and head back to wherever you call home, or I can do ole Roger a solid and end this now.” He looked at each of them, the plasma pistol never moving. The rider who’s gun Eckhart took stepped back from Eckhart and helped get the middle rider up and onto his one good leg. While he and his wounded companion hobbled toward the remaining bike, the last rider stared daggers at Eckhart. The final rider unholstered his plasma pistol slowly and then dropped it at his feet. The wounded rider took that moment to pull his own pistol and take aim on Eckhart. The two remaining riders climbed up onto the bike and everyone in the store could hear the strain on the engine as they revved it up. The engine of the glider roared to life and carried the two men off into the desert. Ignoring the body still smoking on the purple desert sand, Eckhart stomped into the store, pushing past Noah. Noah’s mother tossed the rifle onto the counter top and walked behind it to check her invoices. Out of habit, Noah’s legs started moving. He was well into packing up the last of Eckhart’s supplies into the crates when an idea finally surfaced through his shock. “What?” Annie asked her son. Noah had heard that phrase before, usually whenever someone tried to explain the oddness that defined Eckhart. Except that no one ever knew what war that was. “What war?” Noah asked his mother, and it wasn’t for the first time. Annie was obviously getting frustrated with her son. She’d just killed a man and avoided another robbery of her store. She was stressed to her very limit, and her son was asking her what seemed like ridiculous questions. “Obviously, it’s that war that he’s always talking about.” Annie started the march back toward the store, giving the body a wider birth than she had during her first path. Except that made absolutely no sense. The Bridge had been closed for hundreds of years, restricting all travel from Paradiso to its nearby moon. Since the closing of the Bridge, their had been no actual wars on Paradiso since the closing of the Bridge. Survival was hard enough on the harsh desert world without adding wars into the mix. At least, that’s how Noah knew it to be. Noah hadn’t realized it, but Eckhart had been within earshot for the entire conversation with his mother. “Than why do you talk about ‘the war’ all of the time?” Noah pressed. Eckhart’s tone carried finality with it, and only led Noah to believe even more that Eckhart was hiding something. Noah scooped up the last crate from the counter and handed it off to Eckhart. Suddenly embarrassed, Noah’s mother began stuttering an apology. With that, Eckhart walked from the store and loaded the last crate into the back of his buggy. Much to Noah and Annie’s surprise, he then scooped up the body of the last bandit and threw it on top of the buggy. With a final nod to the Wimmers, Eckhart climbed aboard and drove off. They both watched him go and didn’t say a word until he was out of sight. Want more Bridge Over Paradiso? ​I’ve been incredibly interested, since day one of knowing that such things existed, of making a Podcast. I’ve even done it, multiple times. Usually with pal and cohort in crime, Bob. First we did the Epic Dwarven Blogger Elite (https://epicdwarvenblogger.wordpress.com/tag/podcast/) Podcast, where we basically talked World of Warcraft with guests and the mechanics of leveling hunters and such. Then we did Spoiler! A Book Review Podcast, where we read books, gave you a complete synopsis and then our reviews. And then I was working on the DW Radio Show, a podcast that’s goal was to provide authors with marketing information (like there aren’t a ton of those out there already) and author interviews (ditto). There are a few things to consider when making a podcast, and any of these three could lead to you shutting your doors. Another thing to consider is the people you work with. A lot of shows are just one person, and those aren’t a lot of fun. So, if you decide to work with more people (ie: cohosts, podcast networks, audio editors, whoever) make sure, without a doubt, that they are either working for you or are at least aligned 100% with your vision. When Bob and I did the Epic Dwarven Blogger Elite show, we started off with a simple idea that was a blast for us, but we were blinded by an offer for unlimited free hosting of the show. The company wanted us to record the show live (never did that before, we like editing), if the show started to get boring to them (which was all the time, since they aren’t WoW fans) they would interupt us, very randomly, with their own guests who would cuss (not something we did on the show) or verbally disrupt our guests by asking them topics not related to the show, and they would write us scathing emails if viewership was down. That isn’t someone we should have worked with. They drained our spirit and took something fun from us and turned it into work. I loved playing WoW, and while it doesn’t hold interest in me today, it was that relationship that was directly responsible for me quitting the game. Content is another big thing to consider. Specifically, less about what the show is about and more about how to come up with fresh and new content for every show, no matter your schedule. With DW Radio, author interviews are nice, but they aren’t all that I want to do. I’d like to continue doing articles about how to maximize your author business, but doing so gets boring, as I’m the only host. An idea here would be for me to turn the focus of those very same author interviews into how they are effectively handling their author business. Do they see themselves as successful? That’s my most recent problem: fresh content. Interviews are nice, but they don’t pay the bills (metaphorically). I need content that isn’t only fresh (read as “new”) but is also exciting and makes people want to tune in. That’s about it, I guess. Those are the big concerns that I had to learn the hard way. Another concern you might have might be ads. Ads are fun ways to monetize your site. You can reach out to a ton of different websites and ask to be an affiliate. The big ones that everyone seems to use are Stamps.com and Audible.com. Both will give you money when people use your information to sign up for an account and they tend to accept a bunch of folks. You could also sell ad space if you have a specific type of podcast. For instance, I tend to relate to authors and readers, so I’ll sell ad space for books via my website. Want an ad placed, gimme money. Easy peasy and helps to turn what might just be a simple hobby for you into a means of getting some easy cash. This has somehow changed from a “geeze, podcasts ain’t easy” to a tutorial on how to start your own. In that vein, I’d encourage you to download Audacity, (just google it, I’m too lazy to grab you the link). Audacity is a simple, professional level (I say, as not in anyway a professional) editing software for anyone with recorded audio. I’d also encourage you to go to Fiverr.com (there’s a link for you, now get off of my back) and pay $5 for a simple intro with music that can be yours and yours alone. Maybe pay another $5 and get some credits read to music that you can tag to the end of your show. Anyway, the reason that I brought this up is because I really want to revamp DW Radio, or start a new show altogether. Ren and I have talked about a bunch of ideas, but none of them have sung to us yet, or they involve more effort than the amount of reward we’d receive from doing it. Sticking to just revamping DW Radio, I think maybe I should start doing interviews of multiple authors at one time, where we discuss a little bit about their background and then go over how they handle their writing as a business. Another idea I had, compiled while talking to both my father and author Larry Clayton about entirely unrelated subjects, would be to just interview authors via recording implements about their journey as writers and making that the whole show. My concern there is that I’d fall into the same hole that I am already in for DW Radio. Anyway, I’m rambling now. Ideas for a show? Looking to start your own? Bring it up in the comments and I’ll let you know what I think. If you’re reading this on 1/14, I wrote this a week ago. It’s my birthday. This is a time of celebration, but over the years the celebration has been changing. At this point, it’s more of an excuse to celebrate than an actual reason to celebrate but whatever. The real reason to celebrate would probably be that I’ve somehow, against all odds if you ask any of my wonderful friends, survived 33 years. Those same friends will probably show mock surprise before recalling the strong force of dumb luck that has helped to guide my life. Anyway, every year I post to Facetwit or Tweetbook that all I want is for you, the person reading this, to buy a copy of one of my books. This year is kind of the same except I want to offer you something too. I want reviews of my books. 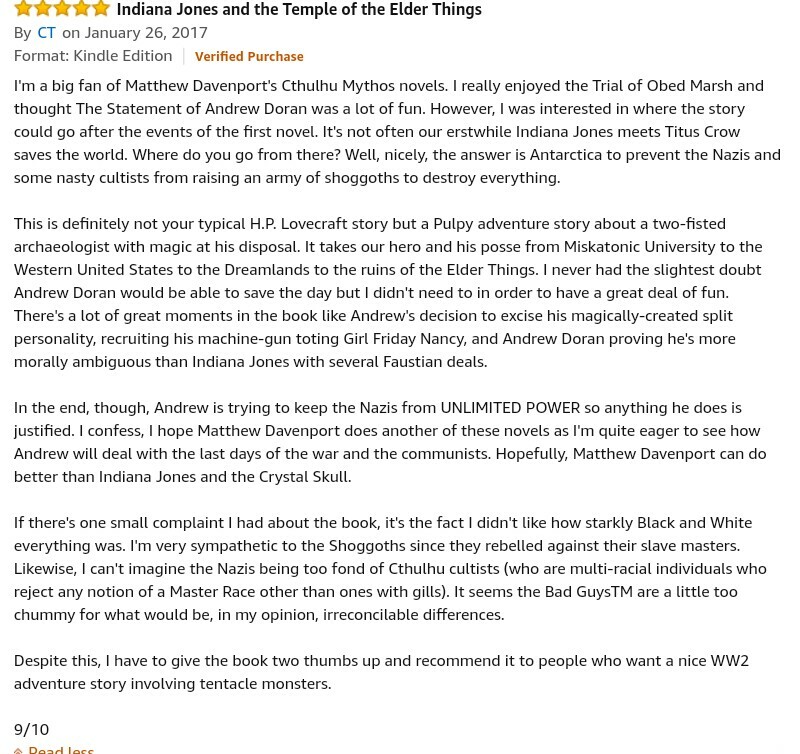 Any title, just go to http://amazon/com/author/MatthewDavenport and pick a title. Send me a message or comment on this. I’ve got audiobooks and ebooks, hell I’ll even mail you a print copy. You just have to message or comment saying that you WILL GIVE ME AN HONEST REVIEW. That’s all I want for my birthday: MORE REVIEWS. Anyway, I wrote this a week ago and am going to get back to enjoying that day. I dunno what I’m doing for my birthday. The older I get, the more I value my free time, so I’m probably at home pretending the outside world doesn’t exist. Nostalgia is Fun: A long rant about the source of Reboot Culture. ​In a decade of more reboots, reshoots, and rewrites it’s easy to get annoyed with media. This has recently crossed my mind from the other side of it. I kind of like, or at least appreciate the sense of “reboot” that has been drowning our culture lately, and the anthopologist in me can’t help but be intrigued by what’s driving this. Without any real test subjects (and a complete lack of re-upping my ESRA certifications) I decided to take a look at myself and what drives my want of some of these reboots, but also drill a little deeper into what I generally like about television and movie media anyway. Of course, I’m typing this while watching the pilot episode of Smallville for the billionth time. For me, the easiest way to start would be comic books. In this day and age, it’s easier to use comic books to examine this kind of phenomenon anyway, as comic book movies, tv, and literature are at a peak of getting retold and rehashed in a million different ways. I mean, we’ve had a ton of Spiderman, Superman, Batman, and Iron Man in the last decade, the comic books have rebooted at least 3 times, and the tv shows have as well. Why? When I examine myself, I need to first look at the creator. Why have I written fan-fictions would probably be a great place to start. When I wrote my fan-fictions for Ghostbusters, Star Wars, Superman, and Doctor Who (and Firefly, and WoW, and I don’t even remember what else) I specifically was writing them because I wanted more stories. Only in the case of Star Wars did my fan-fictions aim to change the source material. In the case of every other story that I wrote, I was writing a new adventure so that I could continue my adventures with my favorite heroes. My stories are all born out of a want to continue the story. When a tale that I enjoy ends, I tend to want more. Either in the form of a sequel, a book, fan-fiction, a tv-show, or whatever else I can get. I would write Doctor Who fan-fictions in order to fill the more than a year gap between episodes. My Superman fan-fiction (an exciting work that asks how Superman would deal with an esoteric threat such as Cthulhu) was written during the hiatus between seasons of Smallville. I wrote my Firefly fan-fiction after watching the Serenity movie. My most recent fan-fiction was during the excitement over the release of the new Ghostbusters movie. In that case, people on Reddit were asking what direction the reader would have taken if they were going to reboot the Ghostbusters franchise. To summarize, when I wanted more of a story, and I couldn’t find the story I wanted, I wrote them. That leads me to my next drive: I love talking about my favorite fandoms with like-minded individuals. My love of Lovecraft’s work didn’t find it’s strength until I found more people to talk about it with. All of those CW Superhero shows (Arrow, The Flash, Legends of Tomorrow, and Supergirl) are a blast because of their shared universe. I can talk to anyone who is watching any one of those shows because of the depth of which they crossover into each other’s worlds. The same happens with Cthulhu and Lovecraft. His world is shared (per his wishes) by hundreds of like-minded authors. Want to see this mindset in action? Go to any ComicCon. You’ll see thousands of people bonding over their shared fandoms. Their shared worlds. Flipping the script: Hunters love talking to other hunters about hunting. Travelers love talking to other travelers about the places they’ve been. And foodies love talking about their curly fries. Everyone’s complaining right now about their favorite stories being rebooted in ways that they don’t like. The reason for that is that we all want our favorite stories to continue our way or the canon way. Canon is the stuff that’s done professionally by the original creators. Less people complain about sequels, for example, than they do about reboots. Reboots change the canon, but sequels are more stories in the universe that we already love. Why do we want reboots but hate them? Because we want more stories in the universes we love but we don’t want the reboots to change anything. The production companies need to understand that we don’t want reboots, we want things to continue. Reboots fail, but I’ll bet that Blade Runner 2049 is going to be loved by more people than Ghostbusters and Batman V. Superman combined. But Matt! What about the reboots that worked? I think the point that I’m trying to make is that we stories are fun when they keep going, but no one wants to see those stories fundamentally changed. I liked the Ghostbusters reboot, but I can see why people disliked it. They wanted to produce the story for the a modern audience, but the audience they should have considered were the lovers of the original. The lovers of the original (using only my own mental state as a research study) wanted to see the story that they were already vested in continue. They didn’t want to see someone’s awkward interpretation of a new one. And of course, you can’t mention the new Ghostbusters without mentioning female roles, woman-haters, and or man-babies. Unfortunately, I don’t think the problems with the movie had anything to do with a female cast. The problems with that movie were in the things that didn’t continue the 1984 story. The parts everyone loved (the tools, the car, the firehouse, Slimer, the Stay Puft Marshmallow Man, the bust of Egon in Columbia University) were all ties to the original. The love of Holtzmann? Completely because of the magic of mixing Egon with Kate McKinnon. They even gave her the Real Ghostbusters cartoon Egon look, and people loved her. They didn’t love the other characters nearly as much because they had no connection with the original. Hell, nobody would admit it, but if they had made the roles more clearly specific to match the original guys, they would have gotten more love. Because people don’t want new, they want more of what they like. Ghostbusters isn’t the only example. Batman V. Superman is another great example. I loved that movie, but had a lot of the same problems everyone else did too. The things that I loved, though? Everything that I loved about that movie could be directly tied to the Death of Superman and the Dark Knight comic books of the late 80’s and early 90’s. Superman after getting blasted by a nuke? Friggen sweet. Batman going toe-to-toe with Superman in a big armored suit? Damned awesome (minus the ‘Martha’ thing). I didn’t care that Jimmy Olsen was a girl named Jenny and that James Olsen was some CIA guy. James Olsen seemed shoehorned in, but Jenny Olsen actually fit, really well, and I loved it. The things that I didn’t like were only story-based. Like Batman’s stance against Superman seemed forced for a guy willing to be Judge and Jury. Also, he didn’t weigh the fact that the Kryptonians really didn’t give Supes a chance to change the battlefield. On that same note, I loved (and I know others probably didn’t) Terminator Genisys. Holy crap, that movie was spectacular. It continued the story, but used the inherent nature of the time travel element to reboot the franchise, but without rebooting the franchise. Prometheus? Same thing. They’ve just told more of the story, and for that reason, I loved it. Give me more, not new, and I’ll probably end up loving it. Anyway, where the hell did all of this come from? That’s easy. My dream is to create a world, like Lovecraft or any of the other examples I’ve listed here, that my fans share and create in. I love the CW shows and their ability to crossover. When I finish one, I can go to the next and get more of the world that I love. When I get all caught up on all of them, I can crack a comic book and get even more. Hell, I’ve read most of the Smallville novels that they used to sell (just to clarify, if all of my favorite fandoms could have book spinoffs, the world would be a much better place. In that vein, special thanks to Doctor Who, Torchwood, and Stargate for keeping the literary love going). I write that knowing that I have a superhero story (Broken Nights) that I’m working on the sequel of. I write it knowing that I’m also creating other worlds (Andrew Doran, Bridge Over Paradiso, The Sons of Merlin) that maybe I’d like to discover other people have written some great fan-fictions for. Or knowing that there’s such a thing as Kindle Worlds, that lets creators play in professional worlds. That would be a lot of fun for me if Kindle Worlds had access to some of the more fun properties. Seriously, Superman should be Public Domain by now. Somebody look at that and get back to me. Or if you know any shows needed writers, give me a holler. So, why do we keep getting reboots? Because we want more, the production companies know that and instead of struggling to give us the more we want, they decide to give us more in the form of new. We end up hating it. They don’t know what they did wrong. Then they go and change all the wrong things and reboot it again. We hate them more, and scream “Do it right!” They don’t understand. This is a crazy long rant, but anyway, I just wanted to put my two-cents in regarding remakes and reboots. Of course, I also used it to beg for a writing job and to inform people that I’d love to find fan-fictions in the worlds that I’ve built. Oh, and I want Kindle Worlds to get their hands on more properties. That’d be sweet. A Great Review of The Trials of Obed Marsh! I love getting reviews. Check out this new one for my book The Trials of Obed Marsh!